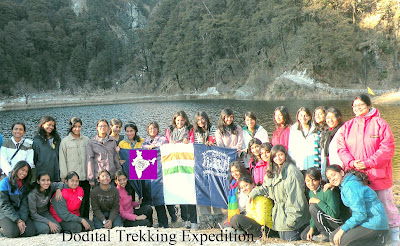 On 11th December, 2011 a group of 37 Bronze and Silver awardees of the La Martiniere for Girls, Kolkata accompanied by a team of Instructors, left for an IAYP expedition to Dodital, Uttaranchal. After completing the necessary journey up till Uttarkashi, where a day was spent in acclimatization, the trek commenced from a point called Sangam Chhati at an approximate elevation of 4000 feet above sea level. The day’s destination was a small village called Bebra (7900 feet above sea level) about 10 kilometres from Samgam Chatti. It was a gradual uphill trek and took about 7 hours to be completed. After reaching Bebra the students were served a small snack and tea followed by some briefing for the next day’s trek which was to be a difficult one in terms of gradient. The students enjoyed the campsite in the moonlight and the soft sound of the stream flowing by. After dinner the team retired in tents for the night with the approximate night temperature of the place freezing below subzero. The next morning the team set off for Manjhi: the next destination which was again about 10 kilometres from Bebra. This gradient was slightly steeper than the previous day and took about 8 hours to be completed. On the way the students were made to indentify many species of high altitude trees like the Pine, Spruce and Rhododendrons and its Gurus flower. Some uncommon birds like the Monal and Cons hell Eagle were also spotted. The team also caught a glance of the Yellowtooh Peak which is a snow capped peak at an elevation of 5740 metres from sea level. The trek was moderately difficult and quite tiring for the students but they enjoyed it for the panoramic landscapes, log bridges and green valleys on the way. The night at Manjhi was the coldest with temperatures freezing at about -7 degrees centigrade. The campsite however was beautiful by the moonlight and the clear sky where numerous constellations could be spotted. After dinner and a hot drink by the fireplace the team retired in tents for the night. The next morning was bitterly cold and it could be seen that the streams around the place had semi-frozen. With sunrise one could catch a glimpse of the shining Bandarpunj Peak which is again a snow-capped peak at a height of 6320 metres above sea-level spotted only from around the Manjhi campsite. After breakfast and a quick briefing the team set out for their final destination Dodital which was a gradual gradient trek of about 7 kilometres from Manjhi. Destination Dodital was reached around 2 o’clock in the afternoon. The vicinity of the vast expanse of the lake mesmerised everyone. Popularly known as the Angler’s Paradise the sight of Dodital was an absolute treat to the eyes. The exhaustion of three days of uphill walking was forgotten and everyone seemed to breathe fresh again. The team was briefed about Dodital and some interesting facts about the lake came to be known. The name Dodital comes from the word ‘Dodi’ which means Trout fish in Hindi and ‘Tal’means Lake. The Rainbow Trout is an exotic specie of fish which was first brought to India by the Britishers. It is usually found in extremely cold climate and is rare in India at the moment. Dodital is home to numerous such fishes. This perennial lake is fed by the glacier located on the Darwa Top at a height of about 12000 feet from sea level seen clearly from the Dodital campsite. The Dodital itself is a virgin lake situated at 10850 feet above sea level that leads to the river stream called Osi Ganga which flows around the Uttarkashi region. It is believed to be a sacred lake of the locals and also has a temple situated by it. The Jungle Crow, Monal and the Cons hell eagle are some commonly found birds there. The rest of the day was left to the students to explore the place, the frozen streams, to catch a glimpse of the beautiful black Rainbow Trouts and to get some get shots for their cameras. In the evening there was a campfire for the students followed by dinner and retiring in tents for the night. The team set out early next morning on its trek back to Bebra this time leaving Manjhi on the way. It was a long trek of nearly 17 kilometres comprising mainly of downhill trails. It was however not very easy since the path was narrow and moderately steep. The following morning the team wrapped up its stay at the Bebra campsite and left for Sangam Chatti where the trek was suppose to finish. It was by far the most tiresome 10 kilometres of downhill trekking owing to its narrow trails, jutting boulders, steep shortcuts and muddy paths.The team hereafter also spent two days doing local trekking around the Ganges in Haridwar and Rishikesh. Finally the team reached New Delhi Airport on 21st December morning amidst fog and a biting cold. After a few hours of wait the team flew back to Kolkata reaching the same in the evening. The team dispersed on a positive note of having accomplished a fairly difficult trek and having withstood extremely rough weather. It was great to see their spirit of self discovery! Thanking the Almighty it was all good in the end.